Young people make life-changing decisions as they move from youth into adulthood. Often this means taking on new roles as employees, parents, or living with a partner. Over the past few decades more and more young people have been staying on in education after compulsory schooling and, of course, getting more young people into education continues to be declared as a policy goal. This has coincided with a rise in the age that young people start these adult roles, perhaps because young people tend to focus on education first and engage with these other roles later. In our latest research, we wanted to see what impact these changes may have had on young people’s health behaviours. Habits formed during this stage of life can persist long into adulthood. Our focus was on the smoking and drinking behaviours of young people in their early 20s. We compared those who had remained in education from ages 16-21 to those who went into full-time employment, and/or started their own families during this period of their lives. We used historical data from two surveys of young people across the UK who were moving into adulthood in the 1980s and 1990s, and another group from the Glasgow area, reaching adulthood in the 1990s. We found that remaining in education was linked to less smoking, while heavy drinking was common among students. For those who did not stay in school, heavy drinking appeared to depend on what else was happening in their lives. Those who moved quickly into full-time employment but did not take on family roles, drank just as heavily as those who stayed on in education, if not more so. On the other hand, those who had taken on family as well as work roles, or made a slower transition into work, drank less heavily than the students in education. These differences were still apparent after we adjusted for a range of differences in young people’s background characteristics. These included: their gender, their own adolescent smoking, drinking, mental health and school performance at age 16, and their parents’ smoking, drinking, education, income and occupation. When does a hangover matter? So, what might explain these findings? 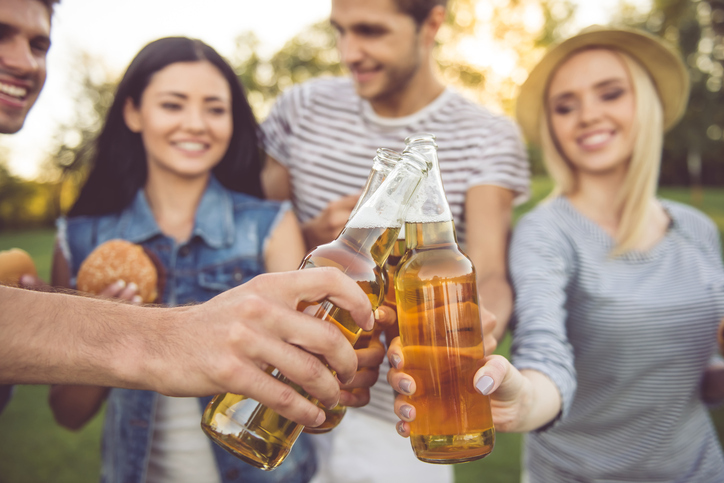 Perhaps the expectations people attach to social roles, especially family roles, can cause young people to act more responsibly, for example by moderating their levels of drinking. Indeed, when young people talk about why they moderate their drinking, they speak of conflict with work or family roles, for example the hangovers being less than ideal, rather than any worry about the long-term health risks of over-consumption. The influence of family roles could also help explain why young people who are not in education, employment or training (NEETs) and who are not looking for work (e.g. because they’re caring for home and family) drink less than their peers. However, the same does not seem to apply to smoking. We found more smoking among young people who were in family roles. This may be because smoking is more addictive, making it harder to moderate behaviour in line with social expectations. Additionally, if the long-term health risks are disregarded, as they often are by young people, smoking may be felt to conflict less with these responsible roles than heavy drinking does. People who are busy and stressed may choose to use cigarettes as a form of relief, which, without the same ‘next-day’ consequences as alcohol, does not interfere so much with the demands of everyday life. While there have been long-standing trends in the UK of people smoking less and drinking more, in recent years drinking has decreased in the 16-24 age group. The data we looked at came from young people reaching adulthood in the 1980s and 1990s, so would we see the same patterns if we looked at young people reaching adulthood today? Well, we found weaker differences associated with education for smoking, and greater differences for drinking in our more recent data from the 1990s than in the 1980s. This suggests that differences between those in and out of education are amplified when behaviours are more common or accepted and vice versa. In 2017, smoking is being viewed less and less favourably so perhaps relatively few young people would take up smoking today regardless of education or other life transitions? On the other hand, despite the recent decline in young people’s alcohol use, the student drinking culture in education might continue to have an impact. Geographic variations in student drinking indicate that such a drinking culture is not necessarily universal or inevitable. Perhaps there are actions which could be taken to dry out this wet culture? Still, we probably shouldn’t focus too much on student drinking either. Our findings indicated similar or even higher levels of drinking among those who’d moved quickly into work after leaving school but had not taken on responsible family roles. It may be as much about being young and care-free as it is about being a student, and being in education does not necessarily mean being free of other responsibilities. Questions also remain about impacts on other public health challenges. For example, how does remaining in education compare to starting a family with regards to obesity or physical activity? The benefits of education are huge, and life-changing. Nevertheless, as much as we encourage education, we might consider how that environment could shape future lifestyle choices. This research was funded by a grant from the Scottish Government Chief Scientist Office (DTF/11/16). The MRC/CSO Social and Public Health Sciences Unit is funded by the Medical Research Council and the Scottish Government Chief Scientist Office. The views expressed are not necessarily those of the Medical Research Council or the Scottish Government.